Canon Private Limited invited twenty -five students from Photography PVA Group to Universal Studio Singapore at Sentosa on 21st May 2010. Group of four students were accompanied by a staff from Canon to enjoy the rides and sights. Our students had a thrilling time, taking rides such as “Canopy Flyer”, where they get a chance to board a dino-proof flying vehicle and enjoy a prehistoric bird’s eye view of Jurassic Park. Among the other attractions visited by the students is “SHREK 4-D ADVENTURE”, where they are seated in a special theatre. They get to see, hear, and actually FEEL the action right from their seat! The show is about Princess Fiona, Shrek® and Donkey on a honeymoon adventure that picks up where the movie “Shrek” left off, through an original 3-D film, complete with jumps, bumps, bounces, air blasts and water spray that bring the action to life! 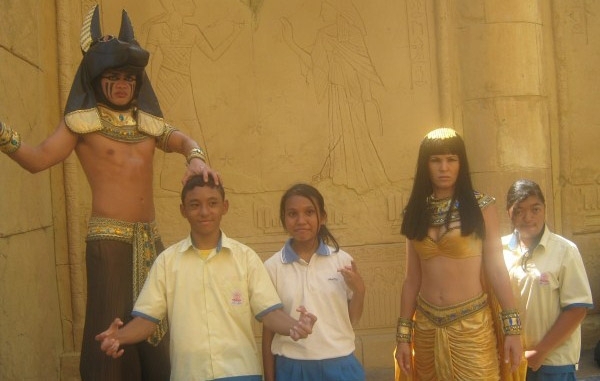 The students also get the chance to take photos with their favorite movie characters such as the penguins from “Madagascar” and the Mummy’s Guards from “Mummy Returns”. The students were also challenged on their photography skills. Some students who took the best pictures won prizes. All in all, they have a great and fatabulous time at Universal Studio Singapore!